How does Google keep its employees fresh for long days and nights of working? With sleep pods. 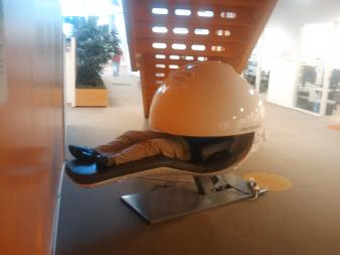 FT reporter Richard Waters was in Google's Mountain View headquarters yesterday and snapped this photo of an anonymous Googler catching some rest. When Richard walked past the pod later, he said a pair of female legs were sticking out from the pod. This contraption is a MetroNap EnergyPod. Metronap says it "harnesses science and NASA technology" to deliver a refreshing nap for users. On its site, Metronap says, "Occupants are reclined into the optimal napping position to promote blood circulation and reduce pressure on the lower back and ambient sounds help nappers drift into light sleep." When it's time to wake up, the EnergyPod delivers a light vibration.